Shortcut keys may consist of one key or combination of two or more keys that offer users an easier way to interact with computer applications without the need to use a mouse or other pointing device to perform the operation. The users who are familiar with shortcut keys can improve their productivity and speed up their works. Like other software (e.g. 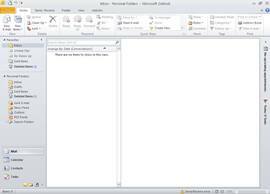 ), the Microsoft Outlook 2010 is also includes a lot of shortcut keys that make it easier for users to work around with menus and other command. CTRL+PERIOD: Switch to next message (with message open). CTRL+COMMA: Switch to previous message (with message open). CTRL+SHIFT+TAB or SHIFT+TAB: Move between the Navigation Pane, the main Outlook window, the Reading Pane, and the To-Do Bar. CTRL+TAB: Move around message header lines in the Navigation Pane or an open message. Arrow keys: Move around within the Navigation Pane. ALT+B or ALT+LEFT ARROW: Go back to previous view in main Outlook window. CTRL+Y: Go to a different folder. F3 or CTRL+E: Go to the Search box. ALT+UP ARROW or CTRL+COMMA or ALT+PAGE UP: In the Reading Pane, go to the previous message. SHIFT+SPACEBAR: In the Reading Pane, page up through text. ALT+RIGHT ARROW: Go forward to next view in main Outlook window. CTRL+R: Reply to a message. CTRL+SHIFT+R: Reply all to a message. CTRL+ALT+R: Reply with meeting request. CTRL+ ALT+J: Mark a message as not junk. CTRL+SHIFT+I: Display blocked external content (in a message). CTRL+ SHIFT+S: Post to a folder. CTRL+M or F9: Check for new messages. UP ARROW: Go to the previous message. DOWN ARROW: Go to the next message. CTRL+N: Create a message (when in Mail). CTRL+SHIFT+M: Create a message (from any Outlook view). CTRL+O: Open a received message. CTRL+SHIFT+D: Delete and Ignore a Conversation. CTRL+SHIFT+B: Open the Address Book. INSERT: Add a Quick Flag to an unopened message. CTRL+SHIFT+G: Display the Flag for Follow Up dialog box. CTRL+SHIFT+W: Open the Mail Tip in the selected message. ALT+ENTER: Show the properties for the selected item. CTRL+SHIFT+U: Create a multimedia message. CTRL+SHIFT+T: Create a text message. CTRL+ALT+U: Clear Mark for Download. CTRL+B (when a Send/Receive is in progress): Display Send/Receive progress. CTRL+SHIFT+D: Dial a new call. F3 or CTRL+E: Find a contact or other item (Search). F11: Enter a name in the Search Address Books box. SHIFT+letter: In Table or List view of contacts, go to first contact that starts with a specific letter. F5: Update a list of distribution list members. CTRL+SHIFT+PERIOD: In an open contact, open the next contact listed. CTRL+SHIFT+X: Send a fax to the selected contact. CTRL+N: Create a new appointment (when in Calendar). CTRL+SHIFT+A: Create a new appointment (in any Outlook view). CTRL+SHIFT+Q: Create a new meeting request. CTRL+F: Forward an appointment or meeting. CTRL+R: Reply to a meeting request with a message. CTRL+SHIFT+R: Reply All to a meeting request with a message. ALT+0: Show 10 days in the calendar. ALT+1: Show 1 day in the calendar. ALT+2: Show 2 days in the calendar. ALT+3: Show 3 days in the calendar. ALT+4: Show 4 days in the calendar. ALT+5: Show 5 days in the calendar. ALT+6: Show 6 days in the calendar. ALT+7: Show 7 days in the calendar. ALT+8: Show 8 days in the calendar. ALT+9: Show 9 days in the calendar. CTRL+G: Go to a date. ALT+= or CTRL+ALT+4: Switch to Month view. CTRL+RIGHT ARROW: Go to the next day. ALT+DOWN ARROW: Go to the next week. ALT+PAGE DOWN: Go to the next month. CTRL+LEFT ARROW: Go to the previous day. ALT+UP ARROW: Go to the previous week. ALT+PAGE UP: Go to the previous month. ALT+HOME: Go to the start of the week. ALT+END: Go to the end of the week. ALT+MINUS SIGN or CTRL+ALT+3: Switch to Full Week view. CTRL+F: Create a message with selected contact as subject. CTRL+J: Create a Journal entry for the selected contact. CTRL+N: Create a new contact (when in Contacts). CTRL+SHIFT+C: Create a new contact (from any Outlook view). CTRL+O: Open a contact form for the selected contact. CTRL+SHIFT+L: Create a distribution list. CTRL+ALT+2: Switch to Work Week view. CTRL+COMMA or CTRL+SHIFT+COMMA: Go to previous appointment. CTRL+PERIOD or CTRL+SHIFT+PERIOD: Go to next appointment. CTRL+E: Find a message or other item. ESC: Clear the search results. CTRL+ALT+A: Expand the search to include All Mail Items, All Calendar Items, or All Contact Items, depending on the module you are in. CTRL+SHIFT+P: Create a new Search Folder. F4: Search for text within an open item. CTRL+H: Find and replace text, symbols, or some formatting commands. Works in the Reading Pane on an open item. CTRL+ALT+K: Expand search to include items from the current folder. CTRL+ALT+Z: Expand search to include subfolders.